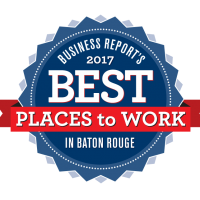 Sigma Consulting Group, Inc. wins 2nd place for Best Places to Work in Baton Rouge 2018!! For the fifth year in a row, we’ve made it on the list! The awards program is presented by the Greater Baton Rouge Business Report. 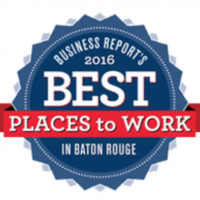 This program was designed to identify, recognize and honor the best places of employment in Baton Rouge, benefiting its economy, its workforce and businesses. We are blessed to have a wonderful team committed to our company, each other, and our community. McLindon Family Foundation (MFF) provides adaptive bikes to special needs children. Since 2008, MFF has rallied a network of extended family, great friends, dedicated therapists, and compassionate donors to give away over 200 bikes in twenty-seven states. Sigma’s employees are community service oriented and we admire the efforts of McLindon Family Foundation. We want to thank MFF for all they do in our community and we appreciate the opportunity to assist in such a small but valuable way. 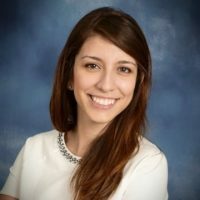 Sigma Consulting Group, Inc. is pleased to announce that Fabiola I. Campoblanco, P.E., successfully completed the requirements for the Louisiana Professional Engineering license and was awarded her PE by the Louisiana Professional Engineering and Land Surveying Board. Ms. Campoblanco, in accordance with rule 1304 (B), opted to take early the examination on the principles and practice of engineering in the Spring of 2017. The successful completion of the NCEES PE and FE exams early in her career, along with her experience, and professional character provides evidence of her ability to practice competently as a Civil Engineer. Ms. Campoblanco earned her Bachelor’s Degree in Civil Engineering from LSU and has been a part of the Sigma family since 2014. She has experience in highway and bridge design, plan preparation, and preparation of engineering studies. 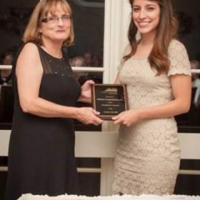 Ms. Campoblanco was also instrumental in launching the Louisiana chapter of Women’s Transportation Seminar, an international organization dedicated to connecting women in the transportation industry and encouraging their career success. She is active in the organization and passionate in its mission of education, mentorship, and encouragement of women to pursue and advance careers in STEM fields. Sigma congratulates Fabiola on the immense accomplishment of achieving her professional licensure and is extremely proud to have her on our team. It has been traditional to recognize special achievement in engineering and construction projects performed by DOTD and their transportation partners as a part of the Louisiana Transportation Conference. This competition recognizes the “best of the best” projects, demonstrating dedication to providing the highest quality in transportation infrastructure to our customers, the citizens of Louisiana and the users of our highways, transit systems, airports, ports and other public works. 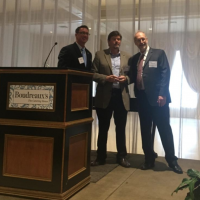 The I-10 Widening (I-49 to Atchafalaya Floodway Bridge) received a 2018 Transportation Excellence Award for a Roadway/Bridge Construction Project over $10 million. Sigma Consulting Group was the road design engineer for the project. Segment 1 from Lafayette Breaux Bridge ($124,743,305) and Segment 3 from Henderson to the Atchafalaya Basin ($63,690,977) are under construction. Segment 2 is still being designed and is scheduled for construction in 2019. Sigma is proud to be a team member on this project and humbled to receive this award as part of DOTD’s project delivery team. 30 Years – A Tradition of Engineering Excellence! 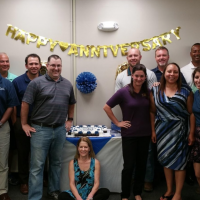 Sigma Consulting Group, Inc. celebrates 30 yrs. of providing engineering & surveying services to its clients & community. 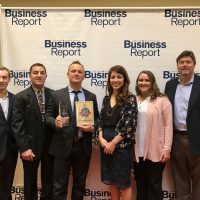 Sigma recognized the anniversary with several events throughout the year including the Providence Corporate Cup 5k Race, anniversary dinner, employee appreciation luncheon, & capping it off with being honored for the fourth year in a row as one of BR’s Best Places to Work. Sigma appreciates its many clients & the local community for supporting & allowing us to serve their needs for the past 30 yrs. Most importantly Sigma would like to thank its greatest asset – our employees & their families! Thank you for your hard work, dedication, & expertise that has made Sigma such a success & a wonderful company to work for. 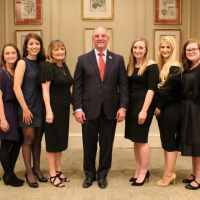 Women’s Transportation Seminar (WTS) Louisiana Chapter announced their 2018 Board of Directors at their Annual Awards Banquet. Fabiola Campoblanco was announced as Director of Membership after serving as secretary for two years. Fabiola is a founding board member of WTS Louisiana. Miles Williams is honored as Philanthropist of the Year by Cenikor. Cenikor Foundation is a treatment center in Baton Rouge, Louisiana that primarily focuses on substance abuse services. They also offer inpatient programs, detoxification, and outpatient and intensive outpatient services. This is one of the many charitable organizations that Mr. Williams supports throughout the year. Sigma Consulting Group, Inc. President, Miles Williams, becomes an LSU CEE Hall of Distinction inductee. The CEE Hall of Distinction was established to recognize individuals who have made stalwart contributions to the profession. Criteria for election include distinguished professional achievement and service to civil and environmental engineering, as well as creating a substantial impact in their field and to the Department of Civil & Environmental Engineering. Fabiola Campoblanco was awarded the WTS Louisiana President’s Award for 2016 at the WTS Louisiana 2016 Banquet. WTS is an international organization dedicated to building the future of transportation through the global advancement of women. 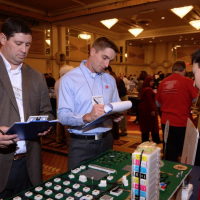 With over 6,500 members, including both women and men, WTS is turning the glass ceiling into a career portal through its professional programs, networking opportunities, and unparalleled access to industry and government leaders. Sigma wins first place for best places to work. The awards program is presented by the Greater Baton Rouge Business Report and sponsored by the Greater Baton Rouge Society of Human Resources Management and the Louisiana WorkForce Commission. 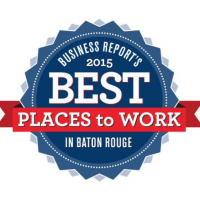 This survey and awards program was designed to identify, recognize and honor the best places of employment in Baton Rouge, benefiting its economy, its workforce and businesses. View the article here. 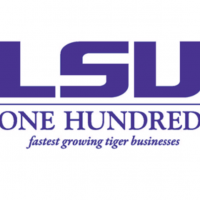 “Businesses submit financial details to LSU to be considered for the Top 100 list. 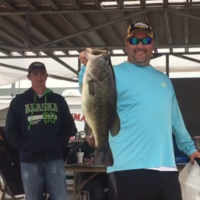 They have to be in business for five years or more, had verifiable revenue of $100,000 for the 2012 to 2015 calendar years and have a former LSU student as owner of at least 50 percent of the company or as chief executive officer, president or managing partner. Rankings are determined by compound annual growth over a three-year period.” View the article here. Sigma is named an LSU Fastest Growing Tiger Business for 2015. The LSU100: Fastest Growing Tiger Businesses (LSU 100) identifies, recognizes and celebrates the 100 fastest growing Tiger-owned or Tiger-led businesses in the world. In addition to celebrating the success of the honorees, the LSU 100 provides a forum to pass lessons on to the next generation of LSU entrepreneurs. The LSU 100 was created to offer encouragement, education, networking and assistance to entrepreneurially-minded students, faculty, and businesses. View the article here. The Forever LSU Campaign and the LSU College of Engineering announces a pledge from Sigma Consulting Group, Inc. to establish the Mike Dooley, P.E., Professorship in Civil and Environmental Engineering (CEE). Sigma Consulting Group supports our communities through active participation in United Way, recycling programs, local blood drives, and the Providence Corporate Cup. We are happy to contribute to the growth and success of the student run extra-curricular groups through financial support and by offering personal time to lecture at ASCE meetings and co-sponsoring the annual LES Jambalaya Dinner. Open communication with the administration, faculty, and student groups of Louisiana State University (LSU) is a valued aspect of our business. The sharing of news and ideas help keep us abreast of changes and trends in the academic community. We have engineers at Sigma that teach Senior Design classes as Adjunct Faculty members in the College of Civil Engineering at LSU. 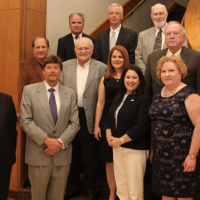 Several of our employees at Sigma have served as board members for LES, ASCE Baton Rouge Branch, and WTS Louisiana. 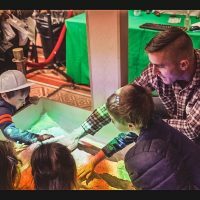 We support the public involvement efforts of these organizations, including MathCOUNTS, Future Cities, and the William A. Wintz Scholarship Program, and the Girl Scout BIG and STEM Events.